The most popular Ted Talk of all time is one of Ken Robinson’s where he argues that schools kill creativity. His popular books, The Element and Finding Your Element also talk about how traditional schooling often gets in the way of students finding their passions. According to Robinson, your element is the point where your passion and talents intersect. He asserts that being in your element allows you to be fully who you are — that without doing it you are not truly yourself. He also thinks that many people go through life without ever finding their element, sort of coasting through the years without true passion and zeal for anything in particular. Finding your element, according to Robinson is a deeply personal journey. We can help kids along the way but they have to cultivate it for themselves. It’s probably more about helping them understand the beliefs and principles behind the journey, which we can do for groups of students, than it is trying to help each one find their unique passion. How do we do it? Here’s what I gleaned from The Element and Finding Your Element. 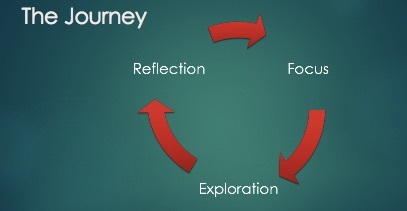 The journey to finding your element involves a continuous cycle of focus, exploration and reflection. Get to know yourself really well. Look beyond what others have told you about yourself, including personality tests, cultural expectations and even your parents and teachers. Seek new experiences, try lots of different activities. Try doing familiar or already tried things in new ways. The first one is all about helping students get to know themselves and to believe that they are in control of their own lives. The second is, of course, trying to offer them as many diverse experiences as possible. The third is about helping them to be divergent thinkers and to recognize and value the diversity of types of intelligence, not just the traditional academic type. The fourth is about helping them to recognize and value something that is larger than themselves. And the fifth is the importance of healthy living and positive thinking on the journey to cultivating your passion. We are very hopeful that schools can not only stop getting in the way but can start doing way more of the things that help students become who they were truly meant to be — even on a large scale. What do you think? Next postWhat does differentiation look like in the classroom?